My father’s visit from Paradise. His name is יהוה / Yahweh ! The Holy Spirit saying; ” If thou thirst to see heaven open and the Spirit of Yahweh descending upon thee, then praise and worship the king of heaven Yahweh by this song… “ Now open thine mouth and with a loud voice cry out to Yahweh till thou get it … Amen. יהוה / Yahweh, יהוה / Yahweh, יהוה / Yahweh,.. Warning to the people of Sodom & Gomorrah! The Civil War is coming to America and then Russian invasion on the east and Chinese on the west. Choose today for whom you shall live, fight and die. I choose as EliYah to live, fight and die for God of the Bible Yahweh! Or you choose to live, fight and die for “666-USA.gov“ lover and defender of these 666/LGBT-Sodomites, to be with them in a hellfire. Psalm 58:10 The righteous shall rejoice when he seeth the vengeance: he shall wash his feet in the blood the wicked. Prophecy of February 15. 2017 Hear the word of Yahweh , ye rulers of Sodom; give ear unto the law of our Elohim, ye people of Gomorrah. His holy spirit causes me to follow Him,…Will you? My mission is to know Him and to make Him known ! 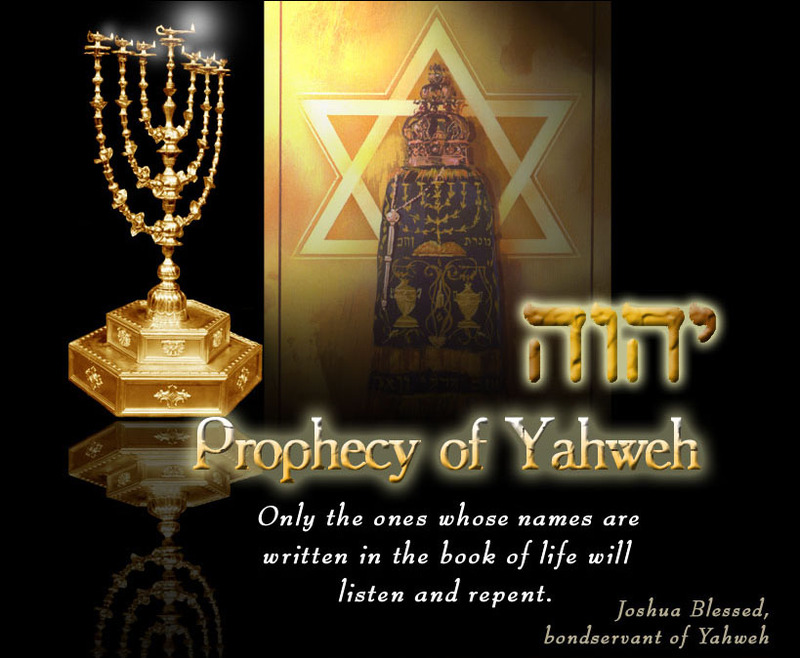 Shalom to all people of Yahweh! The king of heaven Yahweh of hosts does not need nor He pleases with our vain man-made religion, nor our religious activity, nor endless talking/ posting on Facebook, ,… But in these Yahweh delights! Prov.23:3To do righteousness and justice Is desired by HWHYYahweh more than sacrifice. Lev.19:15Ye shall do no unrighteousness in judgment: thou shalt not respect the person of the poor, nor honour the person of the mighty: but in righteousness shalt thou judge thy neighbour. Jer.9: 23. Thus says Yahweh “Let not a wise man boast of his wisdom, and let not the mighty man boast of his might, let not a rich man boast of his riches; 24but let him who boasts boast of this, that he understands and knows Me, that I am Yahweh who exercises lovingkindness, justice and righteousness on earth; for I delight in these things,” declares HWHYYahweh . Jer. 22:3. Thus say Yahweh , “Do justice and righteousness, and deliver the one who has been robbed from the power of his oppressor. Also do not mistreat or do violence to the stranger, the orphan, or the widow; and do not shed innocent blood in this place. … “, Jas 2:5 Hearken, my beloved brethren, Hath not God chosen the poor of this world rich in faith, and heirs of the kingdom which he hath promised to them that love him?